A program to increase the amount of fresh fruits and vegetables available to low-income Iowans is expanding. The “Double Up Food Bucks” program was launched last summer. It gives Iowans who qualify for “food stamps” an extra $10 dollars each week to buy fresh produce. The program runs during a four-month period in the late spring and summer. “This year we have expanded the ‘Double Up Food Bucks’ program from six sites last year to 13 in 2017 and that spans eight counties in Iowa,” says Aryn McLaren, director of programs at the Healthiest State Initiative, the organization that manages and raises the money for the program. The extra $10 per week for fresh produce may be used at farmers markets in Decorah, Des Moines, Dubuque, Grinnell, Iowa City, Spencer and Tama. In addition, McLaren says four “mobile markets” in Waterloo and Des Moines are now places where food stamp recipients may use this extra money to buy raw fruits and vegetables. “Once again, helping to increase that access to the fresh, healthy foods,” McLaren says. The program is financed with private support. Nearly 400,000 Iowans currently are qualified for government food assistance, officially called Supplemental Nutrition Assistance Program or SNAP benefits. SNAP recipients use electronic debit cards at stores for qualified purchases. 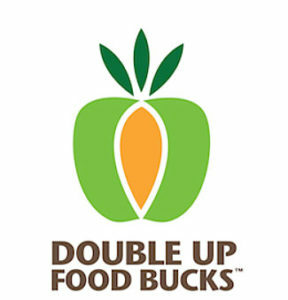 The farmers markets and mobile groceries involved in the Double-Up Food Bucks program all offer card-swiping services to customers. Tthe list of participating food stands and farmers markets includes the “Greens to Go” mobile produce stands in Waterloo; Spencer’s Riverfront Farmers Market; the Dubuque Farmers Market; Iowa City Farmers Markets; the Grinnell Farmers Market; Red Earth Gardens in Tama — the local food source for the Mesquakie Nation; the Northeast Iowa Winneshiek Farmers Market in Decorah plus the following locations in the Des Moines metro: Beaverdale Farmers Market, Downtown Des Moines Farmers Market, Drake Neighborhood Farmers Market, Lutheran Services in Iowa Global Greens Farmers Market and the Nourish Mobile Grocery Store in Des Moines.